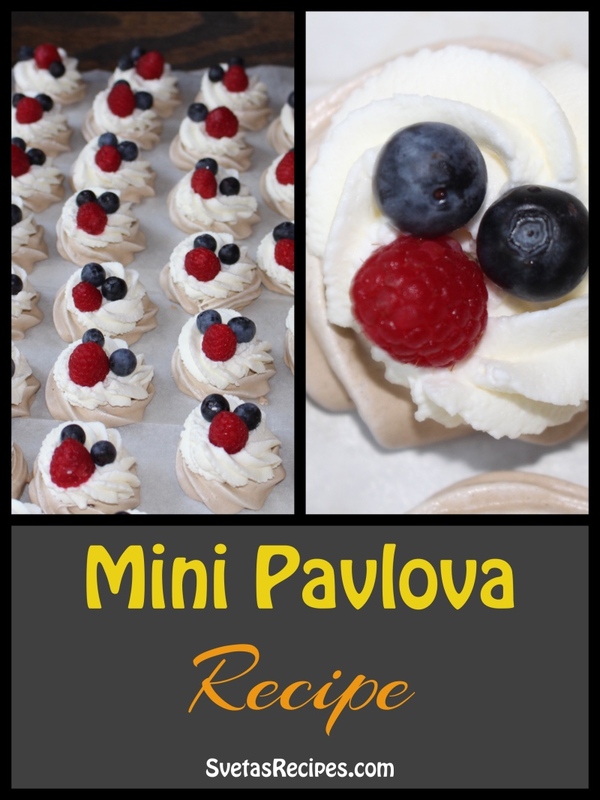 This Mini Pavlova is a very easy dessert and has a very refreshing taste. It also includes a rejuvenating chocolate taste in the meringue. 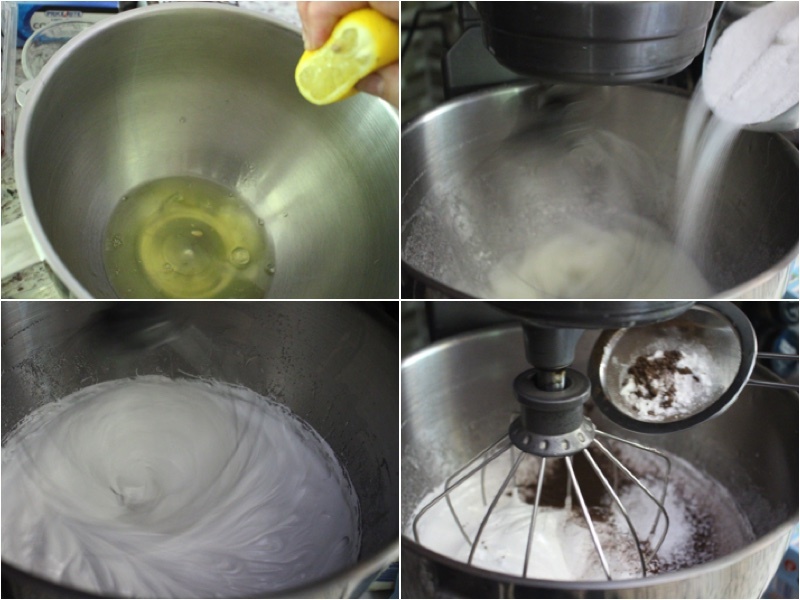 To start the recipe add egg whites to a large mixing bowl with lemon juice, beat on a medium speed for a few minutes while gradually adding sugar. Next add your cocoa powder, corn starch and vanilla extract. Beat again on a medium speed for around 5 minutes. 2. Fill a piping bag with your meringue and add a star tip, using a little bit of force pipe out small roses onto parchment paper. Continuing transfer your parchment paper onto a baking pan, Bake for 30 minutes on 250ºF, after change the temperature to 200ºF and bake for 2 more hours. 3. Beat your heavy cream in a mixer until you have a cream, also add condensed milk and mix with a rubber spatula. 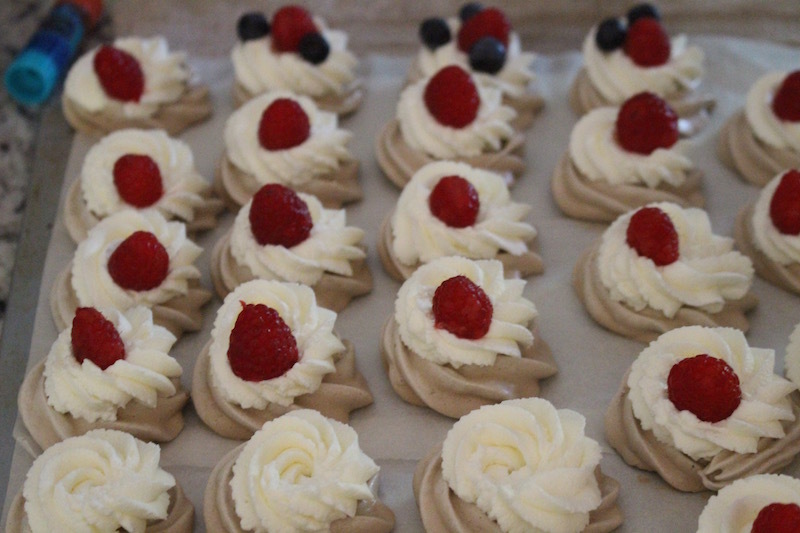 Using the same star tip with a different piping bag, pipe out roses on each meringue. 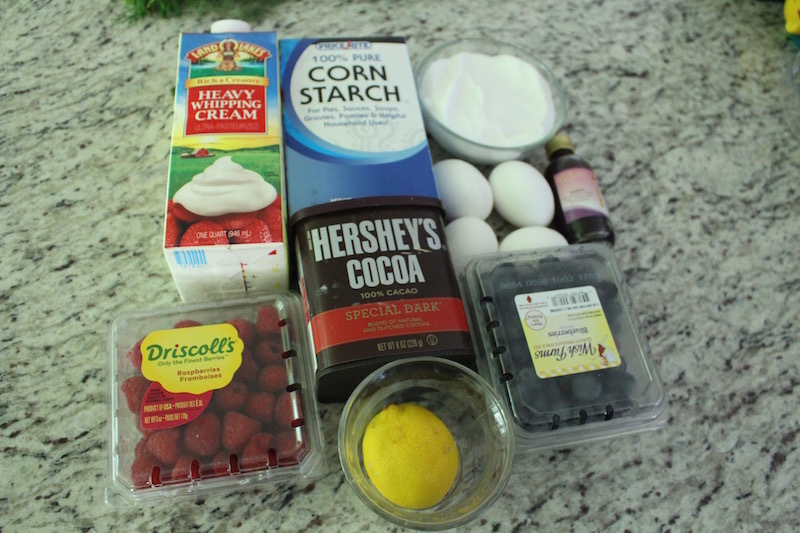 Now you can add 2 blue berries and 1 raspberry on each meringue. Enjoy! Fill a piping bag with your meringue and add a star tip, using a little bit of force pipe out small roses onto parchment paper. Continuing transfer your parchment paper onto a baking pan, Bake for 30 minutes on 250ºF, after change the temperature to 200ºF and bake for 2 more hours. Beat your heavy cream in a mixer until you have a cream, also add condensed milk and mix with a rubber spatula. 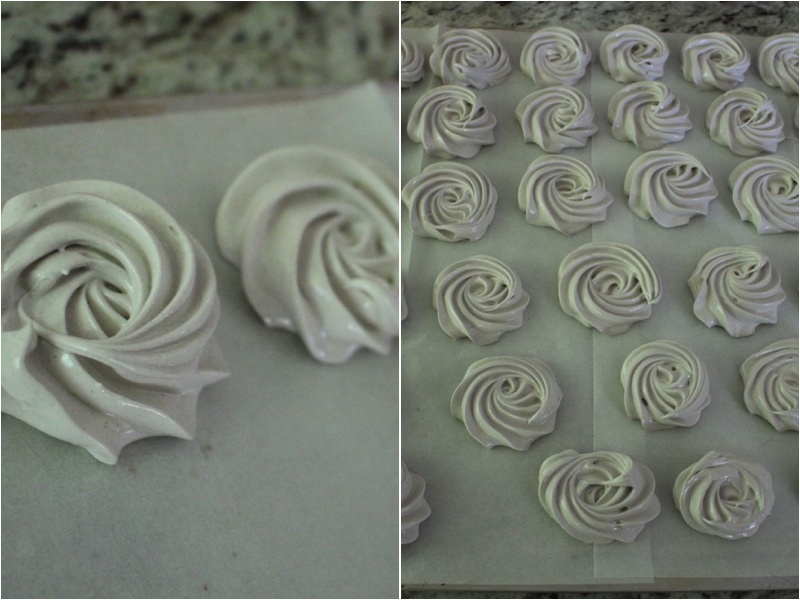 Using the same star tip with a different piping bag, pipe out roses on each meringue. 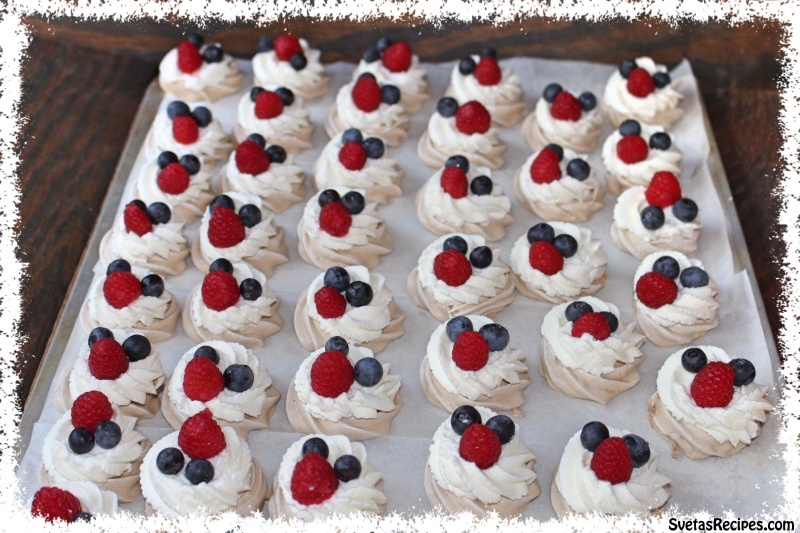 Now you can add 2 blue berries and 1 raspberry on each meringue. Enjoy!